My wife will cry when she sees this photo – there’s something about the plastic containers that just drive her aesthetic senses mad! Despite that, this is not the first time I’ve posted a plastic container on one of my photos. Nor, likely, will it be the last time. To be perfectly honest, I think it helps to illustrate an important part of our daily lives which is far too often brushed in to the background: healthy food for lunch. See I make breakfast and lunch every day for myself and my wife, and we take them with us in – you guessed it – plastic containers. I understand her reticence to encourage me to take pictures of our plastic containers. They’re not exactly stunning pictures! But they’re every bit as important as the meals where she helps me to take the stunning photos that you’ve seen here. A healthy lunch is not to be ignored! You’ve seen the “light and airy” spring salads that I’ve been displaying as my breakfast salads over the past couple of weeks, right? They’ve had things like baby kale, arugula, strawberries, kiwi, and turkey. They’ve been amazingly delicious, satisfying, and like every good breakfast, not leaving us full or in need of a nap. Well, with today’s lunch salad, I am going to take a bit of a different approach. Today’s lunch salad is all about the rich, strong flavors that can be used to make a really satisfying lunch. It’s not so much a spring salad, as it is a spring feel on a very summer salad! Start by putting the pork loin in a pan with some water and cooking it on medium heat, covered, while you make the salad. This salad is all about the rich, earthy flavor of radish, carrots and smoked pork loin. It would be easy to lose myself in just the smoked pork loin, the flavor is so rich and delicious. The scent of smoke rolls around my mouth languorously in the same way that the vapor of the chops wafted about my kitchen this morning. Slice and chop the other vegetables, starting with the frisee and cucumber. While the flavor of the dish is all about the smoked pork loin, in order to be able to truly enjoy that flavor, it’s important to have some really delicious supporting vegetables to give that smoked pork loin it’s freedom. The frisee does that admirably, it’s light and crisp, as is the cucumber. Together, they provide the substance of the salad, while their light flavor stays out of the way of the rich smokey flavor of the pork. Similarly, with such a powerful flavor like smoked pork loin, you need some additional flavors that actually detract slightly from the strength of the main portion of the dish. The radish and carrot both offer a balance for the smoked pork in that they are bright, strong flavors, but not rich in the same way as a smoked pork is rich. 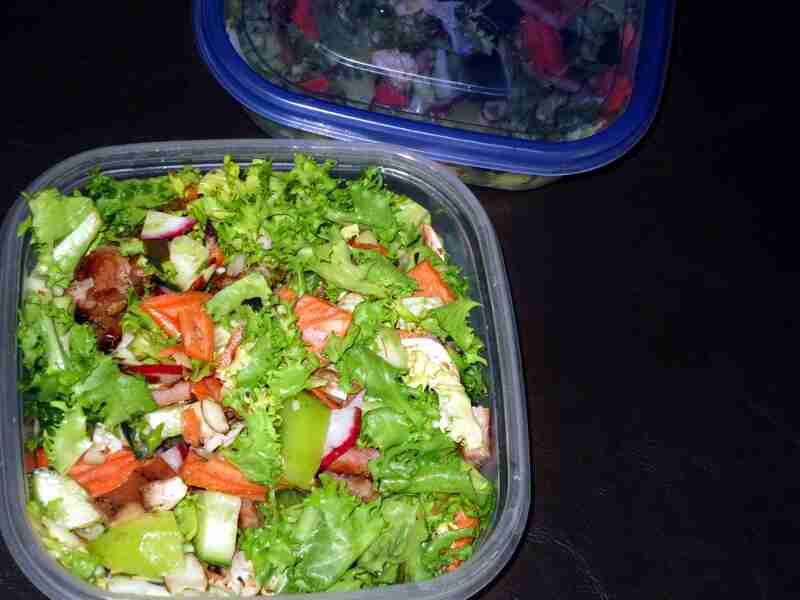 The end result of the salad is something that you can sit down for lunch over, enjoy every bite of, and walk away with that deeply satisfied feeling that a steak could give you, but without the weight of a heavy meal. It’s just the right combination of light and rich, smokey and satisfying. Do you bring your own lunch every day? Or at least, most days? Are you a Salad for lunch kind of person? Soup? Steak? When you’re eating out for lunch, what kinds of eating-out foods do you prefer? I usually just eat leftovers for lunch. I’m not a big salad person, but once in a while it can be good. Maybe more now that it’s getting warm out and the produce will be plentiful. Grabbing a quick lunch out used to be easy (hoagies, pizza, cheesesteak) but these days things are a bit more complicated. I typically get some kind of sandwich, burger, or burrito and just eat the insides, no buns for me. Thanks for writing in Amber! Congratulations on finishing a challenge! I just took a look at your blog, and it looks like your challenge was a Paleo challenge, of one sort or another. There are a bunch of them out there, and I am in support of them all! Whole30, Whole9, 21 Sugar Detox, etc. There are some really good ways to kick-start a Paleo lifestyle! Yeah, real life definitely has plastic! And if I want to be able to afford the top-quality foods that I am buying, I have to save on the restaurant lunches, even if they’re mostly Paleo (bunless burgers, etc) so that I have that money for the Bison Steaks that I picked up last night, or the Organic Strawberry Salad that I posted earlier this week. It’s a trade, and one I’m happy to have made! And yes, plastic is a part of that trade.